Claudia automates and simplifies workflows and error prone tasks. It can set up Lambda and API Gateway for you so you can get moving fast. Casually dropped in the middle of some other announcements but it’s looking good! It was created by Amanda Cohen. Includes a long list of relatively minor tweaks and changes. 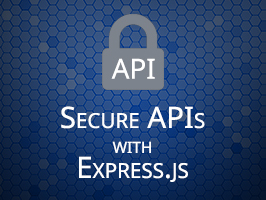 In this tutorial, you'll learn how to build a simple Express.js API and the differences between securing it with HTTP Basic Authentication vs. OAuth 2.0. Learn more. Which npm Packages Get Used With Each Other? Enter an npm package and see which other packages are commonly used alongside it on projects. Compose responsive email templates easily, fill them with models, and send them out. Version 4 came out today. Inspired by commander.js, Vorpal is a framework for building immersive command line apps built around an interactive prompt. All services are built on top of Node and can require any Node module. Note that this platform was built as an entry for a hackathon. Covers things like getting SSL set up properly, server setup, proxying, etc. Emulates an x86-compatible CPU and hardware. It’s been around a while but is still being improved. Designed to be a simple and universal exchange rate library with support for multiple providers. A cross-platform implementation of common Unix shell commands written in pure ES6 with no external dependencies. Go from Node engineer to MEAN stack expert. Get matched with a Thinkful mentor to start learning today.